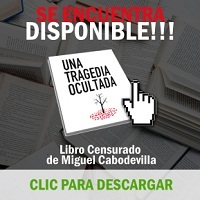 Seventeen minutes before the book was due to be presented to the Ecuadorian public it was censored from circulation “over any medium” by none other than Judge Hilda Garces of the Judicial Unit of Violence Against Women and Family. The reason: the book contained uncensored photos of two Taromenane girls aged 3 and 6 who had been kidnapped during the massacre of their uncontacted tribe. Seemingly unbeknownst to the Judge or anyone else who had not yet read the book is that the authors took great care to protect the identities of “C-” and “D-“, as we follow their terrifying journey from the moment their mother is speared to their arrival in the remote Yarentaro outpost inside the oil giant RepSol’s Petroleum Block 16. The book contained something much worse: a catalog of government incompetence and carelessness in the Ecuadorian Amazon at a time when it was facing a massive public backlash on its decision to drill for billions of dollars of oil in the Yasuní National Park – home of the uncontacted Taromeane tribe now facing the existential threat of genocide. One thing above all becomes clear: the massacre was preventable. Knowing this fact makes the reader feel the tragedy all the more deeply as the authors, a Spanish anthropologist missionary and veteran Ecuadorian journalist, scramble to alert the authorities to stop sitting on their hands and do something to prevent a repeat of the 2003 massacre in which between 13 – 26 innocent men, women, and children of the Taromenane were killed. The book also opens up as many questions as it answers: why did the Governor of Orellana Province celebrate the massacre? Who is airdropping poisoned food onto an uncontacted tribe that happen to live above one of the largest untapped oil reserves on the South American continent? In Part I of this story we walked through events leading up to the assassination of Ompore Omewey, the flashpoint that triggered the massacre, using photos and information passed to me by a contact inside Block 16 while referencing the first 60 pages of A Hidden Tragedy. For Part II I have devoted my limited time and resources to translate excerpts from the moment the authors of A Hidden Tragedy uncover why the Waorani elders were assassinated, to give an incomplete, yet very relevant and revealing view, into the massive human and environmental costs associated with the crude profit of petroleum exploitation in Ecuador’s Amazon. NOTE:The headings, highlights and [comments] are mine to help give context and make the excerpts easier to scan. The first half of the book is written by Cabodevilla from an anthropological perspective and the second half by Aguirre examines what seems like a government coverup of the massacre. The excerpts are ordered primarily by page number but I have placed parts of Aguierre’s investigation towards the beginning chronologically. All the photos below are in the book. The version used to translate was una-tragedia-ocultada-corregida.pdf (a hidden tragedy corrected) which you can download here on Chekhov’s Kalashnikov as well as from the blogs, torrents, twitter, dropbox and facebook pages Ecuadorians used to subvert the censorship. Two Taromenani veterans had approached [Ompore] various times, with some confidence, asking for axes, machetes, and pots. In fact in a Waorani reunion in March 2012, when they filmed this video [of Ompure recounting First Contact with the Taromenane] Ompure told the Waorani assembly about these encounters at his house. He had obtained a few tools from a Waorani employee of Repsol; also Cawetipe, President of NAWE [Waorani Nationality of Ecuador] but it seems this meagre distribution reached only a few [Taromenane] and provoked animosity in others; some of them came to Ompore in a threatening way, demanding tools for everyone. He was terrified. On several occasions [the Taromenane] had robbed his house in the jungle. Following various claims these complaints and intimidations became more often. Not only for tools, but they also complained (as we have seen) about everything that disrespected their territory, for the loud noise of the petrol rigs of the north, for the highways that cut their ancient paths and impeded their passing. The planes doing flights over the zone, normally leave the airports of Shell and Coca, shouldn’t be that numerous in recent months (or years) to not be able to check them. 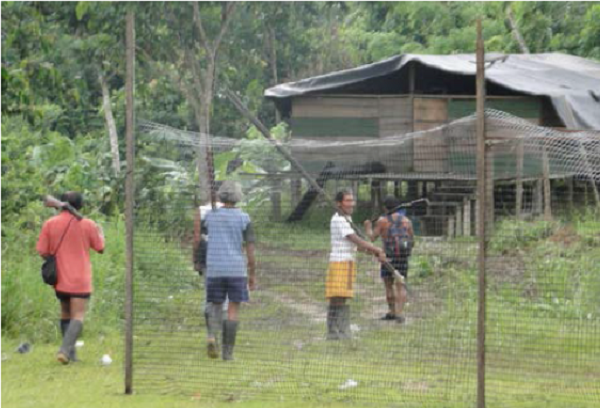 That which is obvious is to say that the Attorney General signaled, first and foremost, that the Ministry of Justice, charged with ensuring strict compliance with the PMC [Plan of Precautionary Measures] are therefore responsible for all actions that pose a threat to the safety of uncontacted tribes. ¿Could the Taromenane have accidentally opened some out of date tuna can, eaten it, and become victims of food poisoning for example? Are there other ways or risks for this alleged poisoning that has been denounced by the Attorney General? We are waiting for an explanation of the flights, also the possibility of homicide perpetrated from the air. This is something extremely serious. Certainly that first interview with the kidnapped girl, made at the beginning of her confinement, surely could not accurately determine the circumstances of these events: date, circumstances of death … In any case it reminds us of another narration we collected from the mouth of Ompure referring to the annihilation of an uncontacted group perhaps prompted by an illness or massive poisoning. What had happened in Yarentaro in legal and political terms was this: people protected by the [Ecuadorian] Constitution (with the government in charge of enforcing it), such as the Taromenani, assassinated two Waorani citizens who must also be protected by the State. Meanwhile an endless treadmill of consultations and meetings began from many different government sectors. An unfortunate feature of this way of doing politics. They argued, as is customary, to whomever was playing the lead in resolving the problem. There were meetings with at least two dozen different secretaries and managers. They collided with each other, got into endless speeches or opinions, and whoevers opinion eventually prevailed was less than what was needed, while the police made the case a secret and controlled every aspect of it. They consulted each other and who knows how many supposed experts in the following days, because after so many years with the problem [10 years since the massacre of 2003] the government team had no one to guide these matters wisely. They lost precious time to react and when they did they incorrectly calculated the internal social composition of the Waorani. During those days we cautioned them with incessant communications to different [government] officials: You have to try and talk with those that are preparing the revenge attack! The only way, probably, is that the Government, above all, recognises its error: we have failed in our protection. Officials or advisers during the situation accepted as routine the expenses of incessant helicopter or plane travel, diets and hotels, etc., but were utterly incapable, and scandalized the Waorani whose family had been speared (we insisted: these people were expressly protected by the government) They can claim compensation. They had every right to it! Waorani of the effected clans left for Coca and other points and made contacts for the adquisition of arms and ammunition. Repeated requests to the authorities to effectively control arms and munitions did not work. Several of the attackers had obtained sophisticated weaponry, 12 shot rifles among others. The final expedition that left the population was organized on the 24th of March. [Since the assassination] 19 days had passed! The luck of the Taromenane had been cast. The Government, with all of its means, had not been capable of resolving, in such a long time, a complex case, but one which involved less than a dozen well known Waorani. To live on such a violent border [the Taromenane “Intangible Zone”] (like some groups situated on the Vía Auca), where there are arbitrary land grabs, forest exploitation, etc., as well as the unlawful acts of many of their neighbours (colonizers and inidgenous) that do not respect this border (above all in hunting and fishing) is not the best school for the Taromenane to appreciate the laws of the Cowori [Taromenane word for outsider]. It is a place with very little law, with very bad laws, we can say. Why didn’t they act? Why didn’t they prohibit weapons, create a strong control, an agreement that could prevent those affected from seeking justice with their own hands? The argument, according to an official from this very government, is that some expert voices on the Waorani blindly told them that the Waorani were incapable of going to seek their Tagaeri/Taromenani brothers, that it was crazy to think that. They were mistaken. Its easy to make such a mistake on this topic, above all, if prejudice and anthropological assumptions are handled unrealistically and entirely wrong. Moreover, not far from all human feelings, common to all cultures and all people: anger, fear, the need for revenge, the thirst for justice. On the 15th of March we wrote back to the Viceminister in private. We sent him a document titled “Some reflections”. One more time, we insisted that if he is not in the community, if he does not compensate the victims, if he does not go to Dicaro-Yarentaro to calm the animosity of the people, something is going to happen. A new disgrace in the jungle was imminent. And we would see it happen, before our eyes, the dead, once again. To inform the public we wrote an article in Vanguardia which was published Monday 18th of March. 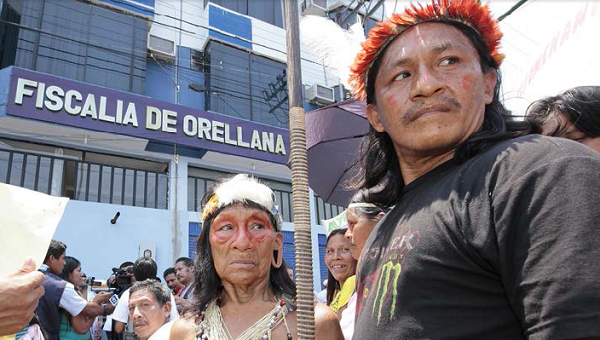 Since then we have expressed to some organizations –the ONWO [Organization of the Waorani Nationality of Orellana province], the Confeniae [Confederation of Indigenous Nationalities in the Ecuadorian Amazon], the Conaie [the Confederation of Indigenous Nationalities of Ecuador], the CDES [Observatory of Collective Rights], the Network of Anthropologists, the applicants of precautionary measures [Plan de Medidas Cautelares] letters in Avaaz.org and Change.org – everybody – worried about what happened and what could happen, even though we explained the unique conflict exclusively from the easiest side: Ompure and Buganey were murdered because of the loud noises from an energy generator, and that Buganey, in the final moments on her deathbed, gave an Anti-Oil Company speech, which suited a series of rumours, depending on the organization speaking or the expert on shift. On the 23rd of March we got the first news that an armed expedition had left to look for those who had killed Ompure and Buganey. Nothing to do. Utter helplessness. Despair. Distrust in the promises of the authorities. Overall, it had been almost 20 days since the assassination of the elders and the authorities still didn’t know what to do, they didn’t speak, and if they did, they said it was a structural problem and should be fixed structurally. 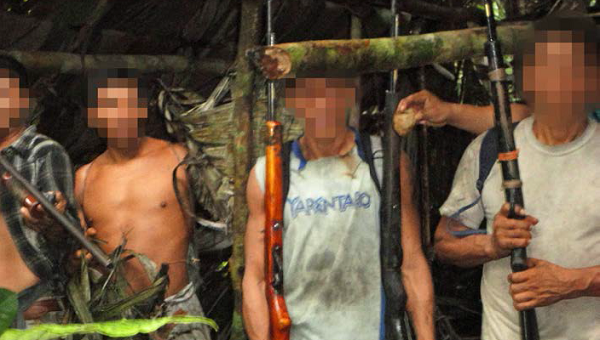 On the 28th we sent the Viceminister another text, “the new jungle of uncontacted peoples”, aiming to contribute knowledge to the circumstances he found himself living. 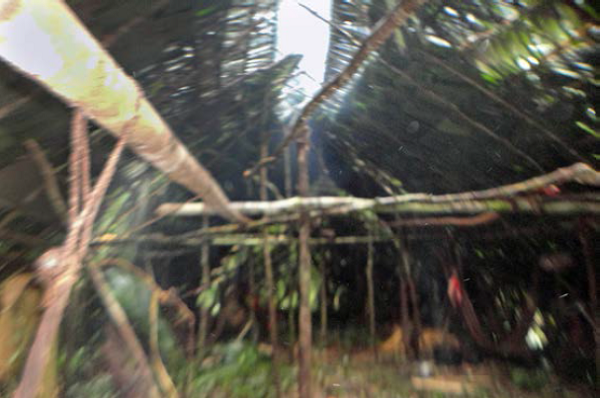 The weekend continued with uncertainty: the expedition had not returned, they were still deep in the jungle. We found out about them on Monday the first of April. The revenge had been consummated. Justice, made there way. Death had arrived. 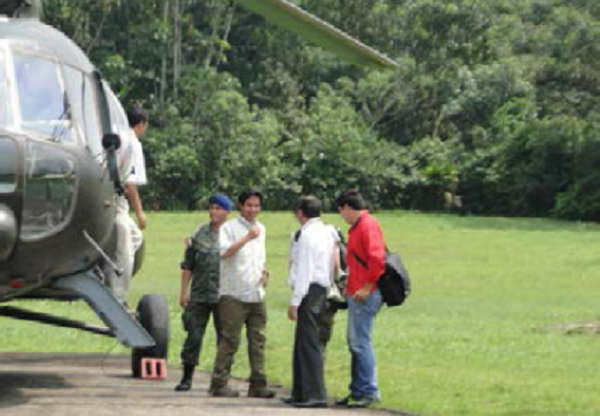 Paradoxically on that same day, the 1st of April, our response from Brigadier General Edison Narváez, Commander of the IV Division of the Amazon, also arrived: there has been no discovery of people dedicated to the sale of arms and munitions in the zone, was his reply. A few hours before the news, we were again contacted by officials of the Interior Ministry. They called to invite us to participate in a workshop prepared on the issue by a different office, one with understanding of the topic and consultants, another with local authorities (again its always the same and ends the same). Hours later we returned their call, but not to confirm our presence on this so called workshop, but to tell the Viceminister that it was all too late, that there was no point in yet another workshop, whether or not the State could manage a structural response: the revenge had been consummated. The Waorani returned with two girls, C- and D-, that they had captured on their expedition. “What! Are we talking about a scenario like 2003?” said the surprised Viceminister. 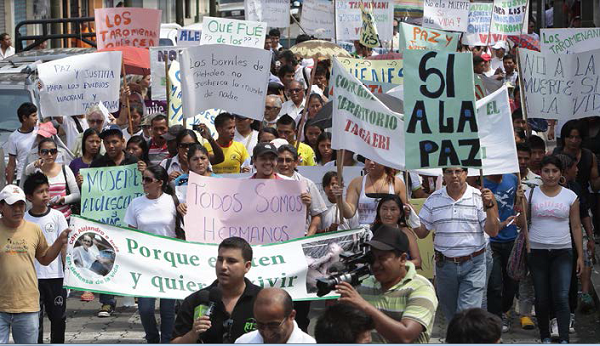 Waorani community leaders Penti and Tepa in the March for Peace in front of the Police station of Coca. In the video of Ompure “The Taromenane told me…” Penti says that one day the Waorani and Taromenane “Will have peaceful contact and we can be as one,” and together the two tribes “will defend the territory” from petrol companies. A photographic report was made during the expedition [to avenge Ompure]. It is a series of 74 photos taken between the 24th of March and the 2nd of April by one of the explorers. 18 photographs are missing from the series. The snapshots, taken on a digital camera, determine the day, hour and minute of when they were taken. They are, therefore, a primary document to the hour of the confrontation when compared with the following testimonies. If we don’t publish them here intact its obviously to conceal the identities of the protagonists. Revealing them is not our intention. We know at the time of obtaining them that these documents were in the hands of the Ministry of Justice, and therefore the use of them was transferred to the police as well as all legal and political responsibility. The photographic guide resumed on the 30th, at 8:30 in the morning. The expedition had discovered an old Taromenane house that was empty. The expedition believes the attackers [of Ompure and Buganey] stayed here on their return. There are monkey skulls with termites, evidently consumed raw. The importance of the discovery for those is shown in the immediate activity of the reporter: 12 photographs in the following 7 minutes. Its the first Taromenane refuge they find. The expedition finds a winding path, with lots of ups and downs, which they anxiously walk. The group knows they are at a key point. On 15´21 they encounter a bridge again, this time with much more Huangana skulls [wild Amazonian pigs] hanging from the walkway, which opens up into a space around a big house that’s also abandoned. They see bones impaled on a stick lying on the ground at the extreme end of the patio: a large series of skulls bleaching in the sun. The expedition talks of finding bones inside the house as well. A sign to warn off uninvited visitors, or trophies in a house of great hunters? “The Taromenane were singing, a song different to what we sing. It was a strong song, strong. They sung like the monkeys sing. That’s how they sang (he sings trying to imitate them but the lyrics aren’t easy to understand) The song seems like its calling the jungle. Ayyyyy, hear the jungle. Like the call of the animals. They sung strong, strong. We quickly went on the path. Others sung, watching the path. They were inside the house, spying the path. Inside they were singing but they had two guards. They were looking above, but they did not see us. Someone will come out, we thought, and that’s how we will shoot them. Some said: “I am going to kill them first.” I thought to go on the left hand side. They sung like Bai de Bataburo, that’s what their voice was like. He he he! They were laughing. All of these people singing, all of them destined to die. That’s why I believe they were dedicated to singing, it was their last song. I. said: “I believe the women are making chica of chonta, that’s why they are singing” We listened in ambush around the house; we kept surrounding it. So that we can kill them as they leave the house! we thought. First you kill, one said, and later we enter. We waited for whoever wanted to initiate. Their young ones were laughing. Two of them came out with spears. When they came out of the door E. was already getting close to the same door of the house to kill them. I believe they came out because the boy wanted to make a relation with the girl. The girl was right there and realised that we were also coming close. One of them entered the house, the girl stayed outside of the house. A. said “they are all about to come out!” E. went first and afterwards I followed. Around the house it was clean. When we entered on another path, you could hear the spears of the Taromenane inside the house. When they came out we killed them all, we killed them as they came out. We shot the rifles, but it didn’t sound loud. At first they didn’t hear. Two times we shot and they didn’t hear. Afterwards, with the sound of another bullet, an elder said, “the Cowori have come! run, run, run! Guri, guri, guri.” There was a shootout, the bullets flew and they fell. Blood came out, lots of blood, blood dripping like water. Many people running. A big man managed to run away and hide. “Guri Guri, Guri, run, run, run!” the big man was saying. Run from those that are killing you, run or they will kill you. There were lots of them. One of them we shot in the eye. We killed them like fat Huanganas, fat, that’s how we killed them, equal to the Huanganas. Those that were skinny we left. Blood flowed like a stream of water. We killed each one with a gunshot, we shot them without stopping. I believe the hand flew with the bullet. I shot a bullet in the stomach of one, but i’m not sure if he lived or died. I’ve only got 4 bullets and I’m out of bullets! We shot them all. There were ten bullets left! You could see well below the trees and shoot. “Look below!” said one. Two Taromenani couples ran. One man came with spears and wanted to kill K., but he couldn’t spear him. You already know how the bullet is: faster. We shot them with bullets and the man who had the spear fell. Another Taromenani was crying, saying we should not have killed them. “We were living well!” complained this man. He was crying when they killed him. “We shouldn’t have killed the family of Ompure because now many have come to kill us,” is how the Taromenani cried. K. was saying: “Why did you come and kill my father?” Just like what they did to Ompure, we speared them. We nailed them with spears. The same. Now some of us laughed as we killed; several of us laughing as we killed them. V. kept stepping this Taromenani against the ground, then speared him from below so the point came out through the mouth, like they did to Ompure. We felt dizzy. After all the people we killed, we felt dizzy. I believe one of them we cut off the head, we stuck a few heads to a stick is how we got rid of two men. When we stopped running, we slept. Afterwards we got up at dawn. The girl who came was soaked wet, she was cold. She cried a lot when she arrived the first time. She cried a lot that girl. She was swollen with crying. We climbed the mountain, the hills, the plains, we climbed up and down, walked and came out on the River Tivacuno. I didn’t think of bringing things. Another time I thought of going back and collecting them. B. wanted to leave them on the hills. Of the monkeys, two monkeys, we came walking. K. stayed asleep. All of us stayed asleep. Life, tradition, mark this. To die or to live, which is another way to say: you have to kill to live. Its the law of the jungle. Two faces on the same coin that fall towards one side or the other, its a question of change, strength, courage, cunning, and determination. The two following images, at 16´06, show a similar scene on the same minute: a young Taromenane, face down in the jungle, shot in the back and pierced by a spear. Together with her, thrown onto his back on the ground, is a child of 2 or 3 years, seemingly impaled by a spear. According to an eyewitness, when they had finished off the wounded and various Waorani dedicated themselves to looking through the property inside the Taromenane house to obtain their booty, a young woman suddenly appeared close who carried with her two girls: C-, already presented here, and D-, her little sister of three years. The three had been outside the house before the assault, maybe in the creek closeby or in some other occupation. Upset by the shootout, surely seeing the massacre of her family, the woman came to offer herself, or she was discovered, when the climax of the furor had already passed exhausting all the bullets. The narrator insists that, from the beginning she appeared absolutely submissive and pleaded with them to respect the life of the three, offering herself to be the woman of whoever would take them. In one testimony, the three were surrounded by some of them, while the rest continued their search [for loot and survivors] As she understood them quite well, she was interrogated about the closeness of her other family. She told them that the other [Taromenane] group had been split off and estranged after their assault on the elders [Ompure and Buganey] (who we are certain were identified as Cowori). The other house was a good days walk away. According to her those members were the most aggressive and violent [of the Taromenani]. She listed the names of the fallen members of her family and her neighbours. Those that listened were in a rush, there was only two hours of sunlight left; less in the jungle. They had to put land in between them in case of a Taromenani counterattack by survivors. Some said to end with the three of them and start the escape. One Waorani laid claim to the two girls, the abduction of girls, both with other groups of Waorani attackers as well as Cowori, is quite a common tradition. Some of them did not accept it, and insisted all of them must die, and it produced a moment of great tension. The testimony insinuates that there could have been shots fired between Waorani had their weapons not been discharged. Seeing this, the woman offered herself to the veteran, and he was tempted to take her with him. The rest did not permit it and said they should not be in charge of her, she was too old to hold while fleeing. So one of them killed her right there, in front of the eyes of her daughters. Then for almost 20 minutes, perhaps in a high moment on the trip, the improvising reporter, offers us the three last snapshots of the expedition; three beautiful portraits of the two captive girls. They have an impressive paleness, surely the cause of being soaked wet, hungry and cold in the canoe voyage, and for certain the terror and newness of everything they were seeing. This man was on the streets of Coca with his camera and photos, leisurely giving declarations to the press, offering this barbaric merchandise to the highest bidder. What did the Prosecutors Office do? They didn’t seize or examine the camera (that showed so many things) or the photos. They also decided not to enter [the site of the massacre] and also prohibited the entrance to that theater of events. They did a lot of aerial flights, that yes, something which is harmful for the survivors, we want them to explain to us one day why. Outside of sporadic visits of scarce bureaucrats from the Attorney and Justice offices, the presence of the State has shone brighter than ever by its absence. We have seen distinct [government] officials hesitant in their behavior, contradicting each other, making unjustifiable promises. Despite what was often expressed by the Attorney General, the fact is that a climate of impunity has been established in the communities as if they had gained definitive ground from the State. This is a very sad story. Not only because of the amount of innocent victims, more than that because it reflects beyond the errors of government injustice, an incomprehensible and generalized human and cultural insensitivity inside Ecuador. Also in international news networks which barely reported on this. As we said, it is more terrible when you consider that killing was not an exception. It was not a surprise, it was preventable. In this, as in the terrible scourge of genocide of the people in that uninhabited jungle, the Government should have the responsibility it wants given. But, of course, it is not their exclusive fault. Neither of these misguided officials invented the disaster that has come to mean the annihilation of uncontacted groups. To say this is to deceive, to not see the obvious. First of April: two girls captured. 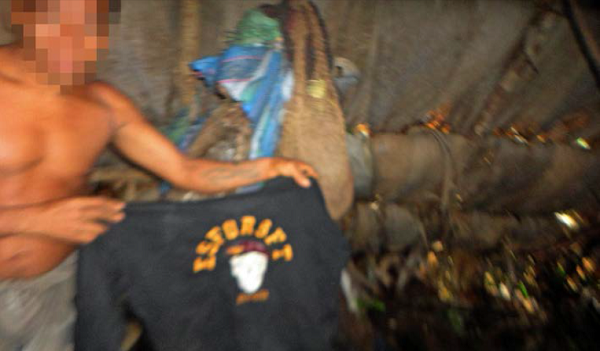 Taken by force from the heart of the jungle after a horrific massacre of their family members. Two girls who can die from the common cold. Two innocent girls, terrified. One with the son of Ompure, the other with another. Girls who are the legacy of vengeance. Girls who are witnesses. Girls who are trophies of war, of a war without sense, of deaths that could have been prevented, or at least attempted. If the deaths of Los Reyes could not have been prevented, or the Ompure’s death either, for being truly unpredictable, this attack seemed predictable and obvious because of the 20 days that elapsed. Municipal governor celebrates the massacre? The vigilantes were happy and proud of their achievement. They show the huge thick spears stolen from one of the Tagaeri / Taromenani houses after the assault. Each one of them has one. They surround the Governor and have their photos taken with her. The photo appears on the Facebook of the Governors Office of Orellana Province, (all officials enjoy the way that social networks, Facebook and Twitter, let them communicate with their constituents) with an alusive text about the visit which says that the Waorani of Yarentaro sent, like a souvenir, a Taromenani spear to the President of the Republic… And that they are now in peace. That calm has returned to the Waorani communities. That Yarentaro and the Government have reached an agreement. Does this perhaps show a hidden agenda? A machevelian plan of premeditated extermination? Or was it simply the slip of a government official who had no idea what to do in such a complicated situation? The Government, through its representatives, celebrating a victory? And recieving a war spear like a trophy as if it was part of national folklore? Ecuador loves life, as the government slogan says? This photo – and the narrative – were deleted immediately off the Internet to avoid misinterpretations. The same day 9 [of April] both the Governor and the police in Coca gave a public statement to the media: “You cannot confirm the massacre, the massacre is just a rumour” Meanwhile, Cawetipe Yeti, president Nawe, armed the newspaper El Comercio – and also the television – that this was not a rumour, that this was true, and gave concrete statements. On the 23 of April, David Romero appeared on telelvision in an exclusive interview, on the program Day to Day on TeleAmazonas. He confessed to having killed 5 people and doing it with spears. “I killed!” he said, “because i’m a warrior”. There also appeared on television a young man, son of one of the vigilantes. “My father killed, killed a lot of people” On the 30th, the Attorney General Chiriboga said on the television channels “There is no proof of this alleged massacre” and that “the investigation has not yet been able to establish the veracity of the information in the number of deaths” At the end of his declaration he assured “yes there was an attack” but did not say if there was or not any deaths. For those of us in Coca, and in the countryside, informed of what had happened, all this was absurd. One day a boy confesses to the crime and another day, the authorities come out to conceal the facts. One day the leader of Nawe, Cawetipe Yeti, asserts that there had been many dead. The other day, the Attorney General of the nation comes out saying there is no proof. And days later, indicates that there were poisonings from food thrown out of the sky from who knows who and with what interests. The result of this confrontation between officials and managers of two branches of government and lack of coordination between different institutions, the powers attributed to one or the other, were effective at only one thing: silence. The silence to shield the country against any international criticism referring to a possible sanction, a call to attention or convicting Ecuador of genocide by inaction or malpractice. Silence is better. The party of silence. For some reason that escapes our understanding, the silence became a slogan and, in some cases, was accompanied by fear, in these almost six months from the 5th of March. Workers on the zoo-creidero project, located 200 metres from where Ompure and Buganey died, were witnesses to this fact. They did not or could not talk about the theme. An anthropologist gave an interview to the newspaper El Telégrafo and was summoned by the police because of his opinion (or because of the use of an official communication medium to give his statement). They told him to rectify his public statement that he made in the newspaper in question. He received threatening calls from people who had worked on some projects. And the panic spread. A group of women tried to talk about the problem of the kidnapped girls, giving their point of view and putting on the table their legitimate worries that the elder girl pointed and confronted one of the men, accusing him of killing her mother. They knew that, for at least those first days, she cried saying her grandmother and uncle were coming to find her. They said that when she heard the rain coming, when the jungle announced oncoming thunder and lightning, “she hid like a rat”, still hostage of her fear. Months had already passed and nobody had an idea what was going to happen to the two children that had been forced to live with their kidnappers, that now wore clothes, who refused to eat anything, who were being photographed, who were now living in houses of cement like the ones in the communities of Dikaro and Yarentaro, to learn about things like cars, televisions, cameras, and tablets. The women signed a petition on Avaaz.org (that didn’t pass 100 signatures) so that the State takes responsibility for the girls, using the pseudonym to avoid retaliations. They presented several scenarios to the authorities, from the possibility of returning the girls to their clan, to the temporary custody of other Waorani families [who were not involved in the massacre]. They neither obtained a response to their request or opened a debate on the topic: its better not to speak, of certain things, to paraphrase the title of a recent Ecuadorian film. 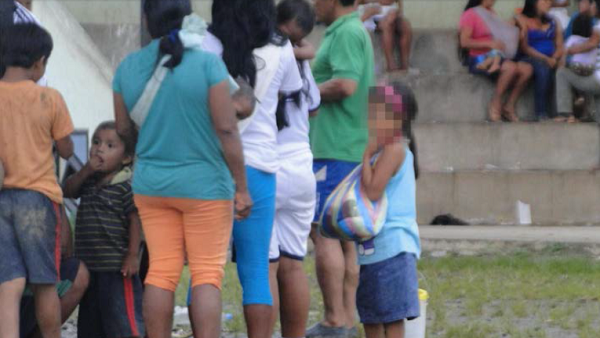 The girls had the status of protected witnesses of the Attorney General, but were made to live with their kidnappers. Didn’t the rapporteur for the United Nations, Mr. Anaya, say that the state must guarantee the physical and psychological safety of the girls? Who is the authority, entity, or instituion that has this competence? We asked the group of women in private because, in public, its better not to speak of certain things. Inside the politically correct, the result is it becomes best not to intervene or comment. 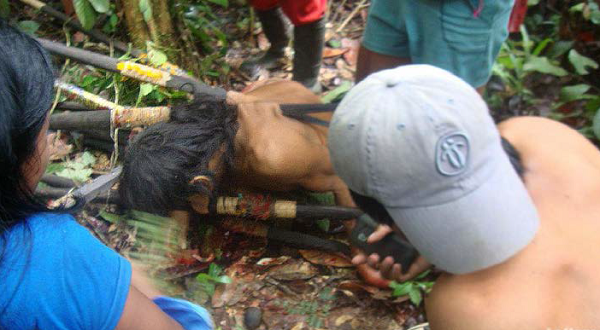 Even though this accommodates unspeakable suffering, to live with those who ended your family, you can say it with a sort of irony that in the case of the Uncontacted Girls the only way to contact them is through the people that killed their parents. I hope after reading these excerpts you have concluded, as I did after reading the book, that a full English translation is needed to warn the international community about what is happening in the Ecuadorian Amazon. The censorship of A Hidden Tragedy was shortlived but fortunately the hamfisted attempt at prohibition accomplished one thing: the blogosphere, social media, and every newspaper in Ecuador were discussing the fate of the two kidnapped Taromenane girls the government had abandoned in the hands of those that butchered their family. It also stoked the Ecuadorian government to partake in a stupidly disproportional publicity stunt to rescue the girls depicted in the Newsweek article After all the people we killed we felt dizzy. Today we know the elder Taromenane girl, Conta, is under the care of Penti, the highly respected Waorani community leader. The whereabouts of her younger sister Daboka are believed to be with those who were responsible for the death of her family. There are however two other books that I believe A Hidden Tragedy resembles more deeply: the first is Eduardo Galeano’s 1971 international bestseller Open Veins of Latin America (which was also censored) in the way it furthers our understanding on how the western world’s thirst for resources is plundering the Amazon. Then there is the renowned 1924 masterpiece of Latin American literature known as The Vortex – translated into English, French, Russian, Portuguese, Italian, Polish and Japanese – which warned the world about the extermination of indigenous tribes enslaved on the Amazonian rubber plantations of Putumayo, less than a century before and little more than a hundred kilometers north, from where the extermination of the Taromenane tribe is currently taking place.